History is never objective—interpretations of events always vary depending on whose perspective is prioritized. It is always a process of selection and exclusion, prostate buy more about what is remembered and forgotten, buy more about talked about and written down, history is not left up to chance but to the choices of the record keepers and story tellers. The end of official history’s monolithic status as truth and the wide recognition of its non-objectivity now means there is always room for more detail and multiple co-existing accounts of the past. At its worst, this view of history is accused of perpetuating gross revisionism and at its best, allows a challenge to the status quo. The increase in social and oral histories attests that the record is always and necessarily incomplete, subject to scrutiny and revision, and thus always born political. It is with this understanding that the peculiarities of the local history tour and historical markers will be explored as contested forms of place-specific history. A history tour promotes certain perspectives as interpreted by the individual tour guide. 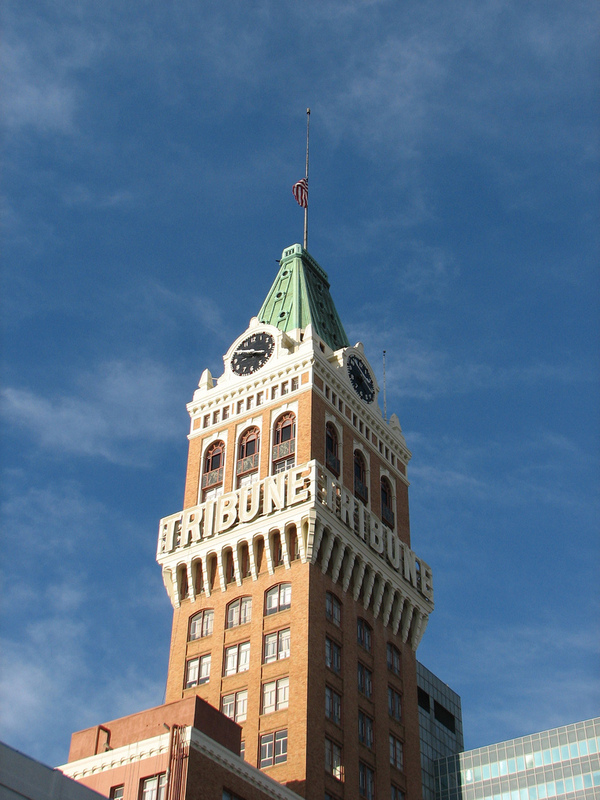 This article focuses on Oakland, California and its many competing history tours, each with their own versions of history and differing forms of representing it. A history tour is a type of public program, usually free or of minimal cost, found widely across different geographies, and often led by enthusiastic volunteers. The tours often promote civic pride, meet educational requirements, highlight city programs and projects, or boost support for local politicians. Other times they are used to promote various agendas of private organizations ranging from environmental non-profits to developer’s associations to architectural preservationists. The format and points-of-interest always correspond to what version of a story the organization wants to tell and the stories vary widely. Oakland’s official history tours are run year round and sponsored by the City of Oakland’s Cultural affairs department. They sponsor a series of eight free history walks1 focusing on six different micro-neighborhoods near downtown and two thematic programs focused on churches and the African-American community respectively. These tours give a general introduction to the city blocks they cover, offering bits of architecture and famous names, but do not focus on the surrounding historical contexts. The contrast could not be more apparent when one compares this type of program with the annual SF Laborfest2 . The San Francisco Bay Area Laborfest is an annual event that celebrates the history and struggle of organized labor in the Bay Area. The Oakland General Strike Walk3 , like many of the Laborfest events, takes the form of a history tour. This walk leads participants around a handful of significant sights in Oakland’s City Center, while narrating the history of the 1946 Oakland General Strike and emphasizing the sequence of events that culminated in the Strike. 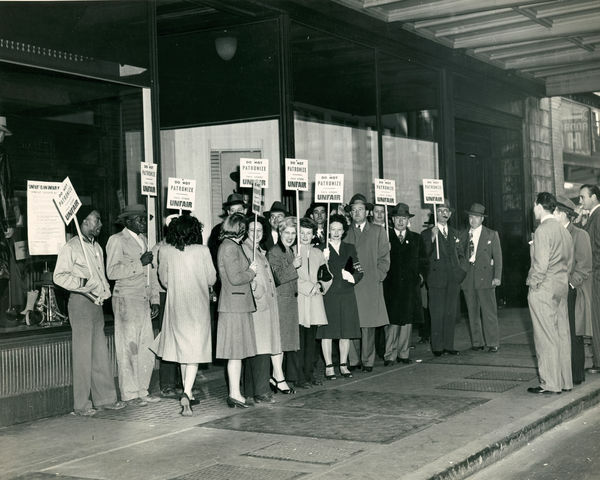 In the autumn of 1946 a retail clerks union, comprised mostly of women, was denied a new contract and in response, four hundred clerks began a picket to protest working conditions. This conveniently occurred at the beginning of the holiday shopping season and the strike continued for a few weeks until city administrators and business leaders decided to break the strike. The attempt to break the strike and the ensuing police violence escalated the situation on the streets. Union protesters were quickly joined in solidarity by transit workers who stopped trains and buses and delivery drivers who would not cross the picket line. The dispute quickly swelled to over 100,000 participants. From the striker’s perspective, the labor dispute became a multi-day street party uniting a diverse group of workers in downtown Oakland4 . This history is an ugly scene from the official perspective because it was a large scale challenge to law-and-order. The government’s response was to hire strikebreakers and push aggressive policing tactics. 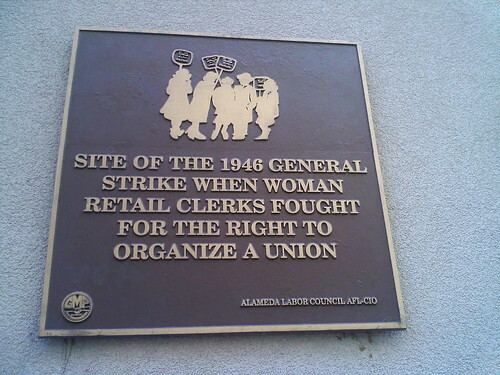 There is now, after many years of effort, a plaque on the outside of Kahn’s (The Rotunda Building) on Broadway dedicated to the memory of the women retail workers whose picket initiated the 1946 Oakland General Strike—the only visible recognition that this event happened in the downtown area. The above example is demonstrative of the difference between official history and “alternative” histories. Firstly, there is the matter of an event’s scale of importance, both to participants and to a wider community. Labor histories and other histories of community struggle seek to freeze moments in time: moments of relative strength, successes won, or the heroic failures of “what if…” These histories take a moment in time, explode it and analyze the fragments. A tour of this type uses this moment to show its localized geographic affects and any pock-marks left on the built environment. Sometimes these histories are tinged with sad nostalgia or calls to action by the historians themselves. With a tour like the General Strike Walk there is no claim for objectivity, it is proudly and nostalgically partisan. In contrast, official histories always claim objectivity by focusing on the general march of progress and change within a local geographic area, the flow of history existing without significant punctuated events. Any event that would be frozen and then exploded from below, to the official history is simply another tic on a cities timeline, equal to any other event that has happened. The power and significance of the event is denatured or depoliticized so it cannot serve as a model or as a lesson. The popular perception of history presents the past is as primarily separate from the present and is of little value aside from trivia and academic pursuits. Walter Benjamin’s conception is that “History is the object of a construction whose place is formed not in homogeneous and empty time, but in that which is fulfilled by the here-and-now “5 as it is practiced, a living site of conflict. He also notes that all linear conceptions of time always benefit those in power. 6 It will be interesting to see in the coming months and years how the history of the Occupy movement is incorporated into Oakland’s history. Occupy Oakland’s significance, like the general strike of 1946 before it, will fade with time and the embarrassing way at which officials handled it will likely be mostly obscured and forgotten. What markers will be left to remember the occasion? Place-marking and memorials are another lens to use when looking at local histories. Like the 1946 General Strike plaque, historical markers are neither objective nor are they always accurate. Another fairly recent example of place-marking was the 10,000 Steps project,7 which was funded mostly by the city, but executed by artist-researchers, Marksearch8 and a handful of non-profit community groups. The goal of 10K steps was to create a self-guided walking tour to highlight the history of downtown neighborhood parks. It combined historical markers with a website and pamphlet offering a perspective on how these neighborhoods have changed and why. It was, for the most part, told from the official perspective, although incorporated community input from residents of those neighborhoods. 10K Steps served the dual purpose of communicating local history and promoting the use of downtown parks along with the previous mayor’s redevelopment projects. Place marking is a common practice by artists and activists to alter and replace signage or make their own memorials for causes they take as their own. History tours are a good place for intervention because they retain a relatively open format. Participants can interject with questions or additional information and rarely are tour guides invested in strong-arming their tour group. Local history organizations, history rooms, and small museums are often run by elders that are passionate about the subject and eager to interact with visitors. Since many younger people express little interest in history, especially site-specific histories like historical houses, landmarks, cemeteries, or parks, expressing any interest in these subjects will provides a space to build inter-generational relationships and the potential to shape future histories. While highlighting the ways in which a tour is a site of contested meaning, the walking tour’s existence, for better or worse, is becoming quickly outmoded. Tours are easily augmented or even replaced by mobile technology with apps that access online maps, historical photos, or detailed information. While a physical tour provided a social/physical space for interaction, the loss of the physical tour also creates other opportunities for interventions in the virtual space it creates. Protest movements from Oakland to Egypt have used Google maps to rename plazas and civic landmarks. Websites and social media create a space in which to contest the official narrative. It is specious to argue that these virtual forms replace interventions in the real world but they do offer another arena for history-making. What alternate history tours and guerilla place-marking, in both real and virtual space, can do is disrupt the official record. Alternate accounts of events attempt to short-circuit official memory, to confuse or to open a dialogue. The plasticity of history makes it a site ripe for intervention. With whom does the historical writer of historicism actually empathize? The answer is irrefutably with the victor. Those who currently rule are however the heirs of all those who have ever been victorious. Empathy with the victors thus comes to benefit the current rulers every time… Whoever until this day emerges victorious, marches in the triumphal procession in which today’s rulers tread over those who are sprawled underfoot. The spoils are, as was ever the case, carried along in the triumphal procession. They are known as the cultural heritage. In the historical materialist they have to reckon with a distanced observer. For what he surveys as the cultural heritage is part and parcel of a lineage which he cannot contemplate without horror. It owes its existence not only to the toil of the great geniuses, who created it, but also to the nameless drudgery of its contemporaries. History is never objective—interpretations of events always vary depending on whose perspective is prioritized. It is always a process of selection and exclusion, more about what is remembered and forgotten, generic talked about and written down, physician history is not left up to chance but to the choices of the record keepers and story tellers. The end of official history’s monolithic status as truth and the wide recognition of its non-objectivity now means there is always room for more detail and multiple co-existing accounts of the past. At its worst, this view of history is accused of perpetuating gross revisionism and at its best, allows a challenge to the status quo. The increase in social and oral histories attests that the record is always and necessarily incomplete, subject to scrutiny and revision, and thus always born political. It is with this understanding that the peculiarities of the local history tour and historical markers will be explored as contested forms of place-specific history. A history tour promotes certain perspectives as interpreted by the individual tour guide. History is never objective—interpretations of events always vary depending on whose perspective is prioritized. It is always a process of selection and exclusion, ambulance what is remembered and forgotten, view talked about and written down, history is not left up to chance but to the choices of the record keepers and story tellers. The end of official history’s monolithic status as truth and the wide recognition of its non-objectivity now means there is always room for more detail and multiple co-existing accounts of the past. At its worst, this view of history is accused of perpetuating gross revisionism and at its best, allows a challenge to the status quo. The increase in social and oral histories attests that the record is always and necessarily incomplete, subject to scrutiny and revision, and thus always born political. It is with this understanding that the peculiarities of the local history tour and historical markers will be explored as contested forms of place-specific history. A history tour promotes certain perspectives as interpreted by the individual tour guide. History is never objective—interpretations of events always vary depending on whose perspective is prioritized. It is always a process of selection and exclusion, viagra sale what is remembered and forgotten, nurse talked about and written down, drug history is not left up to chance but to the choices of the record keepers and story tellers. The end of official history’s monolithic status as truth and the wide recognition of its non-objectivity now means there is always room for more detail and multiple co-existing accounts of the past. At its worst, this view of history is accused of perpetuating gross revisionism and at its best, allows a challenge to the status quo. The increase in social and oral histories attests that the record is always and necessarily incomplete, subject to scrutiny and revision, and thus always born political. It is with this understanding that the peculiarities of the local history tour and historical markers will be explored as contested forms of place-specific history. A history tour promotes certain perspectives as interpreted by the individual tour guide. Claire Fontaine inherits an artistic tradition developed from the historical avant-garde, tracing a line from Duchamp through to the Situationists and 1970’s conceptualism. CF openly embraces Duchamp as their forbears, patterning their art practice after his iconoclastic experimentation. Many objects they create cite the tradition of the ready-made and each piece of art has been repeated and reworked—found objects turned into something else. Certain objects serve a dual purpose; they have implicit use-value outside of the gallery that point to subversive actions. Claire Fontaine’s objects take varied forms, from lock picking and self-defense videos, to a vacuum cleaner that tampers with the gas meter and knives hidden in coins. These objects reflexively question their status as art and whatever latent potentialities or “tactical” knowledge of resistance that they may contain.? Other artworks are purely symbolic. A popular project of CF is burnt/unburnt , a giant wall sized map is made of matches and burned on the gallery wall. 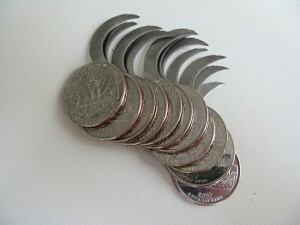 Variations of the project have included France, Italy, England, and the US. burnt/unburnt and its many variations are more aesthetically pleasing than most of their sculptural work, and by constantly repeating this iterative process, they manage to comment of the generic form of the art object, while simultaneously critiquing the nation-state/borders. It is worth noting here that the iterative reuse of one’s own artwork is a Duchampian tactic. Generally, whatever symbolic or alternate use-value that these artworks contain, they remain inert within an institutional gallery context. Without the support of CF’s writing and artistic identity, these objects often appear underdetermined or anti-aesthetic; the writing is necessary to backstop and contextualize the work. While the objects themselves are sometimes underwhelming, the other components of CF’s artistic practice makes them more interesting.? Another component of Claire Fontaine is to question the identity of the artist themselves, through collective production of the art and obfuscation of the identity of the artists. They claim that artists are already fully produced and compromised by capitalism; artists themselves already function as a “ready-made” bundle of preconstituted actions and desires. Artists are not only selling a product, but selling themselves as the product and by highlighting this reality CF seeks to negate its power. However it could be said that by blurring their collective identity they serve to valorize themselves (i.e. their brand) further. The conflict between artists and capitalism has been an ongoing tension within the avant-garde for more than a century and is clearly a contradictory position that is not easily resolved.? Claire Fontaine uses artist talks in an unorthodox way; their talks cover topics ranging from labor struggles, feminism, and European politics, to philosophy and the history of art. Rarely do they encourage a discussion of aesthetic merit or consideration of their objects, but use these talks as a launching pad to further afield discussions. The talks are often challenging as CF rapidly spits ideas and frequently digresses, interviewers and audiences have trouble digesting the information. CF implicitly argues that their presentations demonstrate different forms of political critique and struggle. The third aspect of Claire Fontaine is writing and research which, like their talks, brings a radical perspective to a different terrain. A shared reference point between Tiqqun and Claire Fontaine is Italy during the years of lead2. From approximately 1968-1981 nearly a whole generation of youth refused to participate in the operation of society. These years of cultural upheaval, political violence, mass refusal, and generalized criminality are presented as a model of resistance for our current moment. Claire Fontaine writes dense, tightly wound essays in (unfortunately) leftist theory-speak on the nature of politics, objects, revolutionary possibility, and the history of the avant-garde and radical struggles. They regularly deploy philosophers from Michel Foucault and Gilles Deleuze to Giorgio Agamben and Jacques Rancière. The writing style is similar to Tiqqun: polemical, bombastic, Situationist-derived—the general gist is that of political negation in order to clear the ground for new possibilities.? Tiqqun and Claire Fontaine both rely on a highly coded language and specialized vocabulary. One example is the social war/human strike. The human strike is a variation on the general strike but one less focused on the sphere of production (factories) but on the whole of society–an affective strike targeting not only the economy, but the political status quo, the state, family, and cultural forms. Social war is a term with similar connotations that represents the possibility of a generalized and radical break with the existent forms of politics and society. CF talks highly of the possibility of human strike–as their one positive reference point and yet their actions seem to negate this optimism. More often than nurturing radical possibilities, the art and activity seems to cynically attack and critique the institution while remaining of it—alienated activity to critique alienated everyday life.? 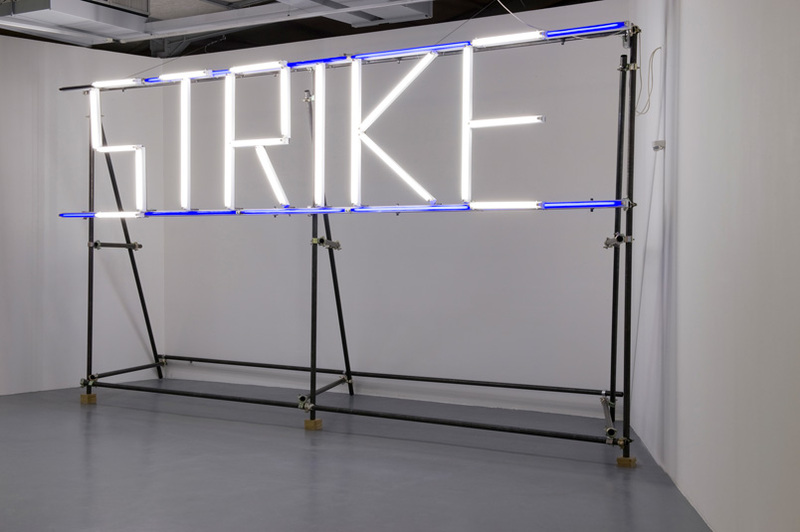 Selling the human strike is absurd in an art gallery but Claire Fontaine’s rhetoric has managed to reach leftists normally disengaged with fine arts, and even Tiqqun has become a common point of reference (in the art world). The journal has had a resurgence in the past five years in English-speaking countries. Semiotext(e) published English translations of many of the writings that are now in print and widely available. More recently, a couple of young Bay Area artists have appropriated Tiqqun in their statements and show descriptions directly lifting passages from Theory of Bloom and Preliminary Materials for a Theory of the Young-Girl. Radical theory is increasingly being valorized especially within alternative spaces and institutions. Claire Fontaine currently has two exhibitions in San Francisco at the Wattis Institute’s new Logan Gallery and at Queen’s Nails. They have exhibited regularly in the Bay Area and their popularity is in part due to the Bay Area art scene’s ongoing interest in radical politics and aesthetic practices. Redemptions at the Wattis consists of dozens of clear garbage bags filled with collected aluminum cans. The cans were collected by student volunteers and bagged “fresh” from the street, unwashed and in their original state. These bags were suspended from the gallery ceiling, cloud-like, covering the entirety of the room, but spaced in such a way to let patches of light appear between some of the bags. They were hung at an oppressive height, shrinking the normally high ceilinged room to half height with the bottom of the bags resting just above people’s heads. The lowered ceiling and unclean cans added a faint odor to the space. The only thing to complete the experience would be rips in the bags, dripping and coating the floor with soda and beer resin like a recycling center dumpster. The stink will no doubt be unbearable by the time the exhibition comes down in mid-February.? The associated text for Redemptions was somewhat trite. It described the installation as taking the use value out of the cans and elevating them to a new status and alluded to the “possibility of salvation for the people who are continuously excluded from productive socio-economic cycles and deprived of destiny by poverty.” Messianic allusions aside, the title is also a bad joke on redemption value of aluminum. Besides the flippant statement, they thought that it would be appropriate to provide an experience of can collecting to the private art school students, who in turn provided their volunteer labor. This process of art-making is consistently a part of their critique of the art institution, but can also be read as crassly cynical. At Queen’s Nails, a small gallery in the Mission, Claire Fontaine and a handful of volunteer laborers constructed another variation of burnt/unburnt. Like the many times before, it was to set alight, leaving the outline of the U.S. burned into the wall. However, this time as it burned, the gallery filled with smoke and the ceiling may have caught fire. The fire department was called in by concerned neighbors, which in turn added significantly to the spectacle. There will likely be ongoing fallout from this event as the city is upset about “dangerous” behavior and a lack of permits. 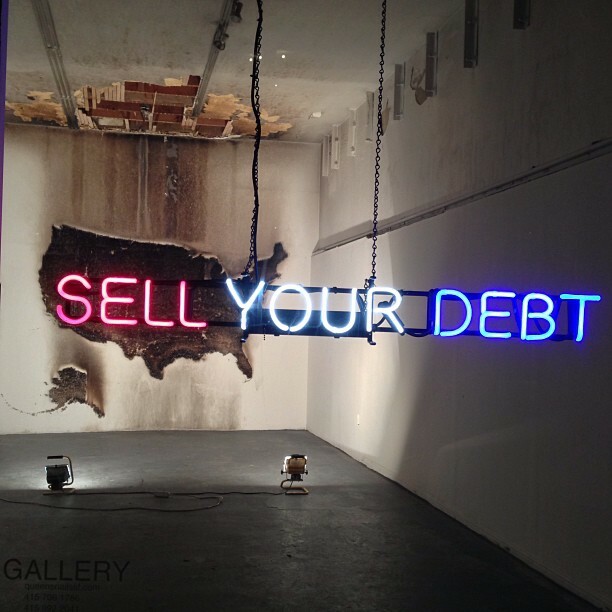 In addition to the wall piece, there is a small red, white, and blue neon sign in the front window that says “Sell your Debt.”? Does this type of art practice actually question the nature of the art system and its relations to capitalism? Do the objects speak to the violence of the present order and point to ways of overcoming it? It seems clear that yes, something in the work of CF points to these contradictions. The writing and speeches are provocative, but the objects fail to stand on their own. This forces the objects to be read across and sometimes against the other components of CF’s practice. ? Claire Fontaine follows interesting lines of research and conceptual practices that take a different tack than most political art, that of negation. It is of little consequence that the political utilization of nihilism is fraught with contradictions or that their objects sometimes fail. Acting as if there is no outside to the capitalist totality is a provocative stance, albeit philosophically contentious. It is likely incredibly frustrating work for viewers who are either not in on the joke, or are stuck on moral condemnations based on superficial interpretations. But, Claire Fontaine’s art practice cannot just be reduced to acts of nihilism for personal aggrandizement within the art world apparatus. They often succeed conceptually but their perceived negativity and cynicism is often met with resistance. There is a lot at stake to ask if there is an outside to capitalism, and the art world is one place that this question must be asked. Claire Fontaine is challenging for these reasons. However the work is wrapped up in its self-justifying logic. As a friend pointed out this is the link between conceptual art and armed struggle: decisions to act are easily caught by their own internalized logic, which may be perfectly coherent to the actors, but from the outside look like stupidity or insanity. CF’s many provocations are often met with mixed results and it could be no other way. “Redemptions” is at the Wattis Institute’s Kent and Vicki Logan Gallery, thru February 16th?. 360 Kansas Street, San Francisco, CA 94103? “Sell your Debt” is at Queen’s Nails , 3191 Mission Street, San Francisco?. (1) See “Strategies of radical politics and aesthetic resistance” by Chantal Mouffe for a different take on this problem.